It all started last week... my friend Danielle tagged my friend Jordyn in a post where Cosmo magazine was saying there were rumors of a Unicorn Frappuchino. You guys know how I feel about unicorns, right? Because one of these days, I'm determined to turn into one. I had a Unicorn birthday party, which I should probably blog...oopps! Fast forward to yesterday (April 18), I woke up sick and in despair because I'm going on a trip this weekend and I don't have time to be sick. I had to cancel my dentist appointment and they couldn't reschedule me for over a month, Avery somehow found a zombie video to watch while I was on the phone, I had to cancel a bunch of small appointments I had to pick things up and I was just OVER TUESDAY. I opened Instagram. 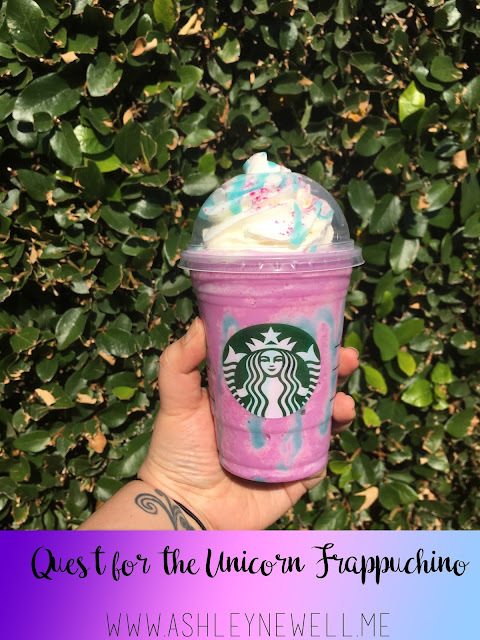 Another local food person posted the Unicorn Frappuchino in my town. She got it on the opposite side of town from me. 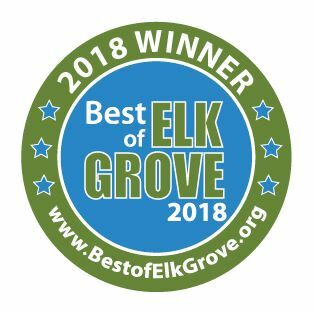 I'm saddened that I didn't get to be the first person in my town to post it. (Listen, I don't understand my own logic but I was sad and I'm allowed to feel my feelings.) I ran over to my Starbucks and ask to order the drink. THEY TOLD ME NO! What the actual heck?? Apparently they have a new manager who would be really strict on this. BOO!!! Then I went home and whined on Facebook about how the mean Starbucks wouldn't like me get the drink a day early. I finally got one today, like some sort of commoner... LOL! I'm kidding, mostly. 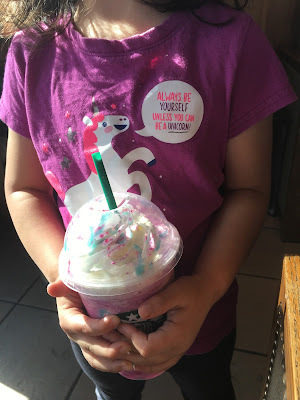 I took Avery and we went to get the Unicorn Frappuchino. I dressed her for the occasion. We ordered the Frappuchino. I carried her across the parking so we could take a photo with great lighting and foliage and then we went back inside to try it. It's fine. It's a Mango Creme Frappuchino (which I've never had before) with blue sour syrup and sprinkles. The blue stuff tastes like the Squeezepop Liquid Lollipops we had when I was a kid. I don't remember if those were actually sour but the consistency is the same. Avery loved the drink, she thought it was so fun! The sourness didn't bother her at all. I could see A LOT of kids really liking this drink and probably even my husband because he likes things like sour Icees/Slurpees. I could take it or leave it. It is pretty good but it tastes like drinking candy. I'm an adult (or something) and drinking candy is no longer one of my life goals. I think the Mango Creme Frappuchino by itself would be a great addition to a summer drink line at Starbucks, the flavor is nice. Overall, it was fun to get the drink and to be excited for it even if I had a slightly dramatic moment. And I love unicorns so I HAD to. I would do it all over again just for the pictures. This looks like the happiest drink ever! I feel ya on the needing to drink candy bit, I love desserts but I don't need them to be overly sweet. I'll probably try it, though, because, do everything once, right? Seeing them all over instagram is a lot of fun, but I'm not sure I'd like it! I prefer coffee! I'm glad I read this because I will probably never try one. I'm not a big fan of sweet drinks, but I will say it's a really pretty drink at least 😊 It's pretty to take pictures of. I'm glad you got to try it. can only imagine the amount of calories in this beauty! Love this! We tried to today too- minus blue syrup since our store ran out- and loved it! I loved that you dressed your daughter up for the event! Sounds like something I would do. Love her unicorn outfit to match the drink...fun! I love how popular unicorns are right now, I actually have a blog post that I'm working on that has to do with our favorite horned ponies. ;) I'm so sorry that they wouldn't give you a drink a day early, I don't knw what the big deal is and why they couldn't just make it for you, especially since you give them free advertising all the time with your posts!